The Vatican Museum and St. Peter’s were interesting but that is all “new” Rome. I’m ready to see some of what made ancient Rome so powerful and, to me, more appealing. I’m particularly interested in seeing old Rome’s Pantheon, first built between 27 and 25 B.C as a temple to honor all the Roman gods. It supposedly was erected on the site where one of Rome’s founders,, Romulus, died and an eagle carried his body into the skies to be with the gods. The Pantheon is listed on our scheduled stops but not on our guide’s. Sigh, this is why I hate guided tours. Despite their descriptions, you never can be sure where you will go—or won’t. Mutiny time. Several of us strongly point out the Pantheon is a scheduled stop and we do expect to go there. She keeps saying there is no time. Then, without any advance warning, the skies literally open up and dump what look like marble-sized raindrops on us. Linda and I happen to be standing in front of a small storefront canopy that is wide enough to shelter us and our camera equipment. We step back under it. The others have rain jackets and umbrellas so no one is drowned. As fast as the rain started, it instantly stops. Is this normal Roman weather? Something has changed the guide’s mind. She agrees to a compromise. She will take a 20-minute gelato break. Anyone who wants to visit the Pantheon may do so. Where is it? Down that street, she gestures. “That will take you right to it and it’s very close.” It looks more like an alley than a street and only 4 of about 30 of us begin to move rapidly that way. Ice cream is that important after a big lunch? From the outside the Pantheon seems a boring square building and not what I expect. The Latin inscription on the façade: M. AGRIPPA L.F. COS TERTIUM FECIT (“It was built by Marcus Agrippa, son of Lucius, consul for the third time”) pinpoints this as the right place. Marcus Agrippa, who defeated the forces of Mark Antony and Cleopatra in a naval battle, constructed some of the most notable buildings in the history of Rome, including the Pantheon. 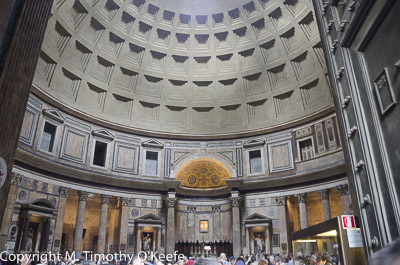 The interior of the Pantheon is what I expect to find: a large cylindrical-shaped room covered by a huge dome with a hole in the center of it. The hole, known as “the eye” or “oculus,” brightens the entire room. There are no windows. The Pantheon is one of the best preserved ancient Roman building. The colorful marble floor with geometric patterns is still the ancient Roman original. Missing, unfortunately, the bronze that once covered the ceiling. That was all melted down by Pope Urban VIII. 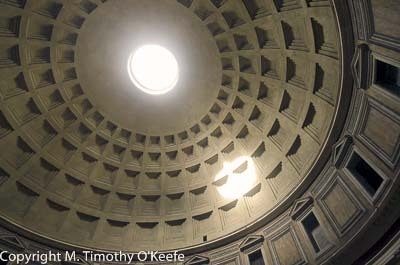 On the other hand, the Pantheon is in such good shape because is has been in continual use since it was built. The Byzantine emperor Phocas gave the building to Pope Boniface the IV in 608 AD and it was used as a church ever since. When Michelangelo first viewed the Parthenon, he reportedly said “it looks more like the work of angels, not humans.” It is actually the work of the emperor Hadrian who in 126 AD replaced the two earlier Pantheons destroyed by fire and lightning. There is only time for a single walk around the Pantheon to meet the guide’s deadline. The building feels like a perfect space and it is a unique space: the interior height and the diameter of the dome are the same dimensions, 141 feet. 8 inches. Modern engineers marvel at the construction work here. But I am continually drawn back to the rotunda, with an inner diameter of 142.4 feet or almost half the length of a football field. It reportedly is the world’s largest unreinforced concrete dome as well as the largest unsupported dome in the world. The oculus in the dome center conjures up thoughts of the eye of God. What it must have looked like when the sun moved across the bronze ceiling! This eye also sheds tears because rain comes right through it, splashing on the floor where it drains away. I could spend at least an hour in the Pantheon but off we go to rejoin the group. 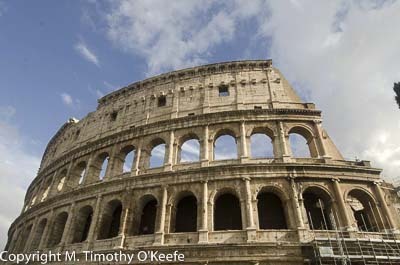 From the Trevi Fountain, we walk downhill to the Colosseum and our bus, passing several recent excavations. 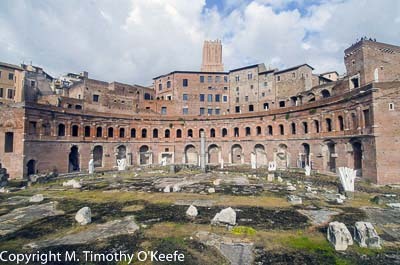 a section of the markets and the column of Trajan. 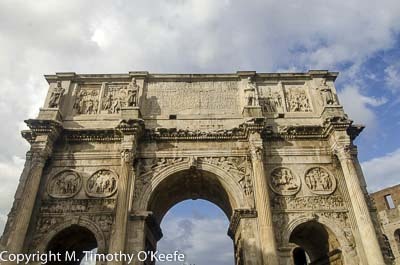 The Arch was erected by the Roman Senate to commemorate Constantine I’s victory over the Emperor Maxentius, who stopped the persecution of the Christians. This is considered the largest surviving Roman triumphal arch and the last great monument of Imperial Rome. It was also our final view of the city. Unlike the long morning bus ride to Rome, trip back to the Prisendam took about 45 minutes.